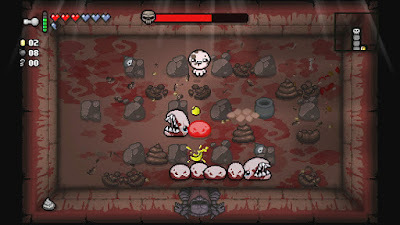 The Binding of Isaac: Rebirth is a remake of the similarly titled flash game that came out 2011. It is a procedurally generated dungeon crawler that draws on religion heavily for it's story. If you want a measure for what this games like then think the dungeon sections of old school Zelda made into an entire game. 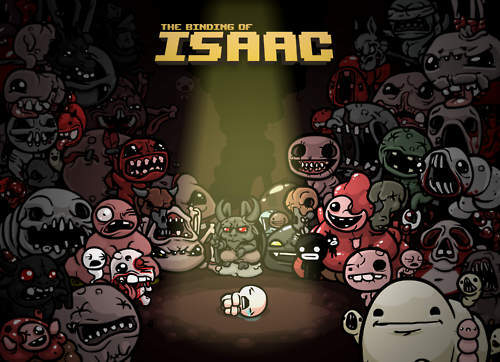 I love the graphical style for The Binding of Isaac, it has an old fashioned pixel art style that is very attractive, characters and enemies are big and meaty and the design of the various different 'worlds' all appeal. Initially you are tasked as Isaac with getting through five different floors of the basement before confronting your mother in a final battle. Each floor is randomly generated with the layout never the same. In general each floor will include secret rooms accessed by blowing up walls with bombs, it will also have a shop and a special room containing a power up. The map style levels usually involve you needing to kill all enemies before you can proceed. Rocks and spikes impede your way while locked doors can only be opened using keys you discover in chests and from defeated enemies. Each floor ends in a randomly generated boss fight. Once you beat the game more floors are then unlocked making there a hell of a lot to do. I finally beat Mom today and don't even think I have scratched the surface of what is contained in this game. Items are also randomly generated and again I don't feel I have seen half of these. The end of each level gives you a random item that will increase your stats (health, strength etc) but in a cool move these power ups are visible on your character, picking up a heart for example will then see you with a huge red pumping heart on your chest. 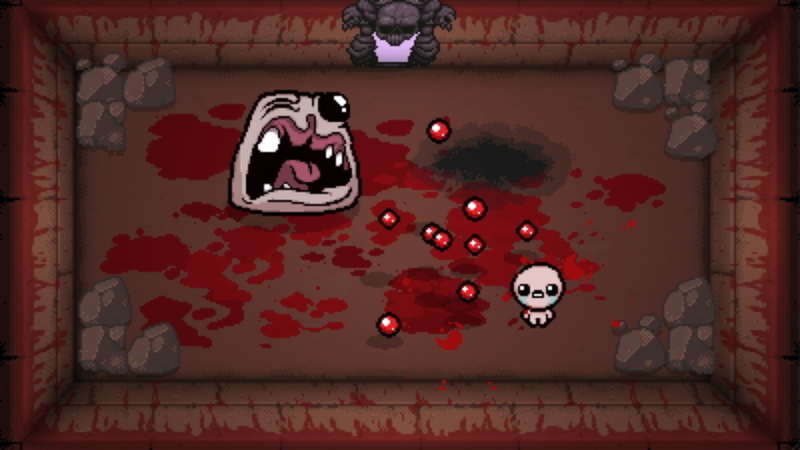 As well as these items there are tarot cards that give you a bunch of different single use abilities (a lot involve warping to a specific room), pills which have unknown effects both good and bad until you use them, and special items that regenerate but take a while to do so. These include ones to help you fight as well as other types. One I had earlier had the ability to turn any of your real heart containers into non permanent but more plentiful ones. You can also gain a permanent item that does unspecified effects, the lock pick for example obviously lets you open any locks for free but others like a broken magnet I still have yet to discover just what they do. For all it's attractive visuals this is quite a messed up game with the majority of enemies being insects and flies as well as other humanoid types and even sentient excrement. 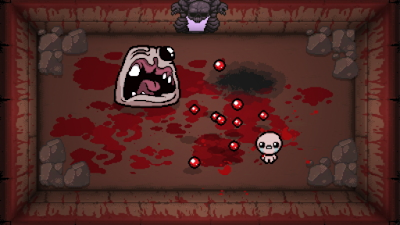 You attack by shooting tears at these foes, when they are defeated they usually explode into blood and guts. Humanoid enemies can be shot into pieces before finally killing them, so you might have to deal with a walking pair of legs with a spine sticking up through it. 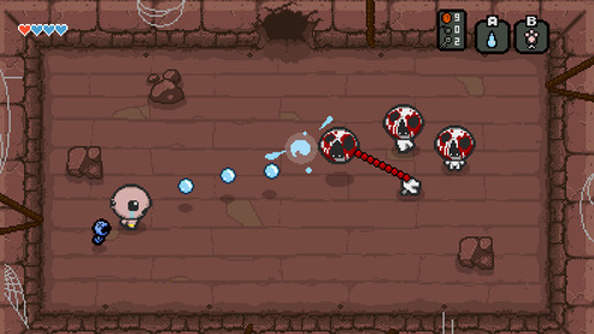 Bosses are usually quite huge and have a variety of attacks but are easy to learn how to beat. You get demonic creatures, giant worms, and other monstrous beings, they are generally fun to fight and quite satisfying. 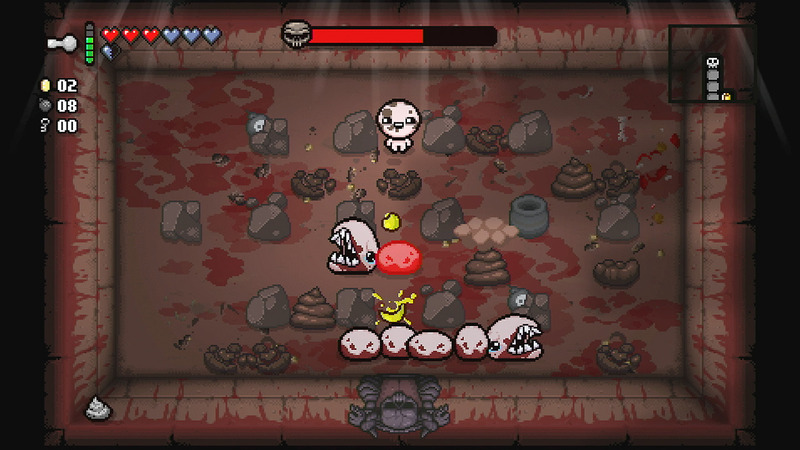 I have been playing The Binding of Isaac for months now and I am still encountering new enemy types and bosses. Starting off weak it is through progression that you slowly build up your stats and abilities making for a hell of an addictive ride, these stats all vanish when you die and there is no option but to start from the very first level again. It can frustrate occasionally when you seem to be getting nothing but the more lame items but that's the flip side of everything being randomly generated. There is so much replay value here that it is really quite ridiculous. There are ten different characters to unlock by fulfilling certain criteria who all play slightly different (such as Lazarus who can come back to life after dying, while Azrael only has a charge attack but can fly over pits and spikes). New levels open as you play, initially it is just the basement but later you get ones set in caves, dungeons and even a level that is set in your Mom's womb! The shop can be levelled up by putting coins into a vending machine, there are secret rooms that contain a Devil or an Angel (you can trade your hearts for demonic powers, angelic ones appear to be free). Randomly hidden throughout the game are mini bosses that represent the seven deadly sins; there is just so much to see and do here and the game is so addictive. I am not done with The Binding of Isaac but I did get the end credits so that was my excuse to write up a review. Addictive and fun with a great style and a subject matter that most games tend to avoid. This is a game you will not regret buying, just be aware the actual variety can sometimes feel a bit lacking, while the story is bare bones.